This is a very difficult blog to write . Yesterday someone highlighted a tweet to me about midwives and how they deal with the impact of caring for a family who may have to face the loss of a baby . It was to do with midwives knitting hats for stillborn babies . I have been a Midwife to many women whilst they birth their baby who has died before labour starts . It broke my heart each time I cared for these families. However I saw the fact that I was allocated to care for them as nothing but a true privilege and joy . I wanted to make the moments they had with their precious child special , full of love and memories . I helped them take the best photos . assisted them through washing their babies and also knew that I had to give them time to grieve and to communicate to them through deeds not words that I was “with them” totally . I cried with them , held them whilst they sobbed , even laughed with them – which may sound strange but it’s true . I cooked for them , made endless pots of tea and I washed their feet . I saw in these women & men a strength that can’t be put into words on a blog . I recall walking a couple through a labour ward to a bathroom with their stillborn son , so they could all be together in the bathroom whilst the mother took a bath – they insisted I sat with them ,so I did – on the bathroom floor – I know these memories are as special to them as they are to me. Midwives do not routinely get counselling post events like this – fire workers and police staff do so is the NHS missing a clue ? In 2006 I reflected on an incident at work where a woman came in to be induced and when I put her on the CTG monitor, we discovered that her darling son was not for this world . I was devastated and had to arrange childcare so that I could stay with the woman & her husband post my 21.00 shift finish . Another thing. that also hit me hard was that the friend I asked to help me with my young family had no qualms about saying yes – I later found out that the reason was that she had given birth to a stillborn son many years before (she told me that she felt by helping me she was helping the parents of the stillborn baby ). As I left the couple to go home much later , I wept from sadness for them and their empty arms as well as emotional exhaustion and was told not to cry by a senior member of staff. I couldn’t go into work the next day . What transpired was an article about my reflection by Rosemary Mander . The mother became a friend of mine & I helped her with a SANDS event – I went to her sons funeral and this connection helped me to cope as much as it did her to have someone who saw her son like she did – as a beautiful boy . It’s so important that we see our role as supporting parents through sadness & also happiness . The midwives who choose to knit hats are simply trying their best – they might not know what else to do – it’s s coping mechanism. You can’t train for events like these just like parents can’t prepare for this to happen to them . My life as a midwife began in 1982. I was a student nurse and on placement on a maternity unit learning about midwifery. I was sent into a room to watch a forceps birth – this was not in an operating theatre where complex forceps births take place nowadays but in a simple birth room – I can’t recall anything apart from the woman screaming and the way the forceps were used – it marked me for life so I don’t know how the woman progressed from it . I put off any thoughts of having my own children because of the way this woman seemed to suffer. Back then I was learning about life in the NHS , how to become a patients advocate , running my dad’s newsagents , continuing with my student nurse course which was run by the nursing school attached to the hospital . I was in shock afterwards and decided then I would never be a midwife . Fast forwards to the birth of my beautiful daughter in 1989 . I was admitted at 0.5cm dilatation and refused permission to go home because that’s how it was then – I was given a cervical sweep without being asked or consented for it and felt violated after the event asking the midwife “what did you just do to me ?” . “I swept and stretched your cervix , you’ll labour now” was the reply – I didn’t know what to say and I was in pain but I accepted it and just felt lost . I did eventually give birth 22 hours after my admission and struggled with the pushing part – the consultant was called in and I recall him shouting at me how to push and threatening me with forceps if I didn’t push harder . I gave birth on my back , semi – recumbent – no-one encouraged or suggested a change of position . I was GIVEN an episiotomy without consent and cannot recall any conversation about why this was DONE to me . More or less straight after my birth I was left alone with my daughter she was in skin to skin contact with me . 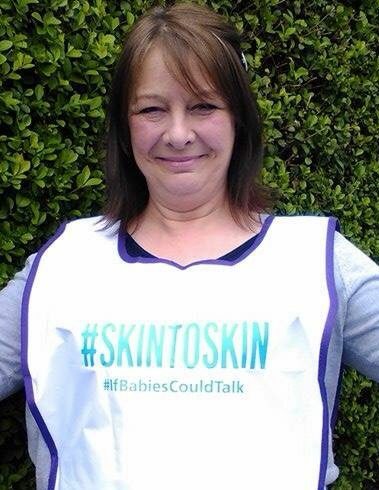 This wasn’t because I knew about the benefits of skin to skin contact at all , but because I just didn’t want to let Jane go – my mums death when I was just 18 years old had impacted on me massively and I saw something in my daughter Jane’s face that reminded me of my darling mum , I was so emotional I couldn’t put Jane down – despite being encouraged to . After the birth I developed bladder problems so had to be kept in for 5 days . I recall feelings of loneliness , sadness , especially when my partner and visitors left . There were strict visiting times in those days , no rule bending , no partners staying overnight allowed . Once home I felt more relaxed but my partner was only given one day off work . I had no one, both my sisters were in high profile jobs and both my parents had died when I was younger . A friend came for a few hours a day and tucked me into bed with Jane , I slept whilst she tidied up , cooked and was there for me , I didn’t know what had hit me . My community midwife Jean Duerden was amazing , I felt unwell had terrible perineal pain and couldn’t walk far – I accepted this as normal – I was a medical ward sister – I knew nothing about babies and / or petineums . My speciality was caring for men and women with medical conditions – a world apart . My community midwife Jean realised something was wrong and I was quickly fast tracked and diagnosed with a perineal haematoma – my sutures were subcuticular and very difficult to release so I had to persevere with analgesia and antibiotics . The visits from Jean my community midwife were the highlight of my days – she would bring a student midwife with her and we would talk about how I was feeling , the importance of rest and nutrition and emotional support . Jean also gave me brilliant Breastfeeding advice . One day I blurted out to Jean about my birth experience and she was amazing . I felt from my moments with Jean that she inspired me to become a midwife . Although my labour experience wasn’t great , my postnatal care was so different . Almost three years later I started my midwifery training and I have to say despite the ups and downs , staff shortages , media portrayal of midwives , the difficulties I’ve gone through in my career I love being a midwife . My own experiences have shaped me and taught me to listen , act and trust women . When I started my midwifery there were no computers – we wrote everything and risk management was very low key . I recall the Fire Officer teaching my group that the most important thing was to keep corridors clear and know which extinguisher to use in the event of a fire . This has stayed with me through my career and I get very upset when I see corridors with obstacles , I make it my mission to clear them . I kept a diary and was so thankful to form a life long friendship on my course with another nurse called April . My tutor Anne Ivill suggested that we would get on and we are still good friends to this day . April went to work on neonatal unit as soon as she qualified and is now a health visitor working with children who have congenital illnesses and special needs . We don’t see each other as much as we should but when we do it’s like we’ve never been apart . So how has my life affected who I am as a midwife and a woman ? The most influential part of my life was growing up in a newsagents shop , talking to people from all walks of life and respecting them all as valued customers . I worked in the shop from a very young age because I mithered my parents to let me . At first I was only “allowed” to sell newspapers or one item sales . The best day was DECIMALISATION DAY . I had learnt a lot at school about this and was determined to help in the shop but my parents said no . I was so upset – then around 7.30 my dad called me into the shop they were struggling – I was to be allowed to help ! I recall elderly people asking me “how much is that in old money ?” And I dutifully exchanged prices bank to pounds , shillings and pence to help them understand . I can recall if I was off school that day or not but if I was in school I still went in as for my parents not to send me I would’ve had to be really unwell . So I hope you enjoyed part one of my lifting the lid blog – in part two I will be referring to my student diary and how hard it was being the only one on the midwifery cohort with a young child. A few weeks ago I was working with Emily Leeder a student midwife who has since completed her training and has now finished her time at my trust . I really like Emily she totally gets me and my sense of humour and she has picked up some of my traits – which is strange but lovely to see – I feel that when I do retire I will leave a little bit of me within Emily’s practice . Emily also inspired this blog CLICK HERE TO READ about the importance of appropriate touch in midwifery . We both saw the positive effect of a small glass of a well known energy drink (NOT Redbull!) made flat by stirring profusely and how women who hadn’t eaten in labour felt better after it . We christened it our ‘chemistry set recipe’ for an energy boost in labour . When we worked together we automatically shared roles and I think that neither of us felt controlled or ruled by the other – we were there for the women and supported them but we were in harmony as future midwife and midwife . Emily taught me the true meaning of mentorship as she messaged me for support and also wrote me lovely feedback for my revalidation. I gelled with her and never felt judged by her or unable to ask if she knew something I didn’t . My reply was off the cuff and I didn’t realise how funny it was until Emily had to leave the room crying in laugher . 3. To thank Sheena Byrom OBE for believing in me as a public speaker and also for friendship and kindness when life was tough for me .